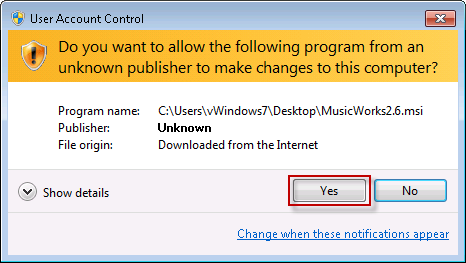 By default, Windows 7 uses UAC (User Account Control) to protect against malicious software or programs - especially those downloaded from the Internet. Unfortunately UAC can make it very difficult for users to install legitimate applications. Assuming you're using Internet Explorer as your web browser, click on the MusicWorks 4 download link from the tierramedia web site and run it immediately by clicking on 'Run' (you can also choose to save the file and run it manually if you prefer. 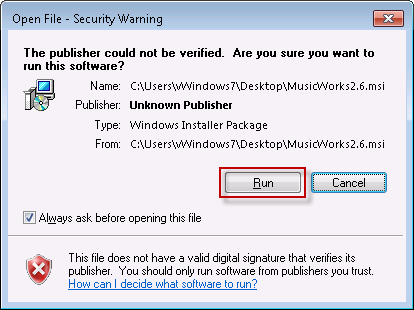 If you receive a prompt saying the publisher couldn't be verified, click on 'Run'. If you've downloaded the installer and are running it manually, you may receive a Security Warning like the following. If so, click on 'Run' to continue the installation. If you also receive the User Account Control message, click on 'Yes' to allow the installation to start. Follow the on-screen prompts and the installation should now complete normally.